Fall is here which means it’s the season of apple picking, crunchy leaves and pumpkin spice everything! As a memory keeper and lover of all things Fall, I’m guessing you snap a lot of photos of this season. But do you have a plan for what you’re going to do with all this awesome photos and memories of your Fall adventures? Or you can join me right now in creating a super awesome seasonal mini album celebrating your top ten favorite things about this Fall, while the photos and memories are still fresh in your mind. 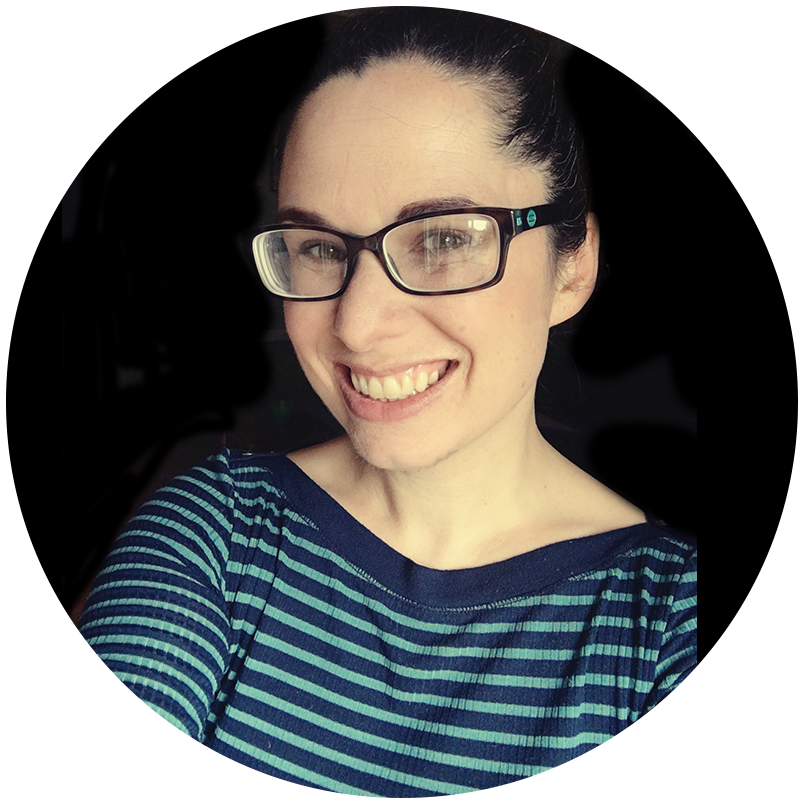 Hi, I’m Lynnette Penacho-Jackman, graphic designer, tech-lovin’ memory keeper and creator of The Faves Project. For a long time, I never knew what to do with all the seasonal photos I took. Should I scrap each one on it’s own individual 12×12 layout? Should I print them all at once in a photo book? Neither answer felt quite right, which meant instead they sat on my hard drive in digital purgatory. Then ten years ago I got sucked into the world of holiday mini album scrapbooking. After several failed attempts at creating a daily holiday mini album, I created my own system, one that would combine my love of mini albums and digital scrapbooking, while still allowing me to enjoy the holidays stress-free. The result was Holiday Faves, a simple mini album system that focused on capturing my top ten favorite things about the holiday season. It was simple, it was easy and most of all it allowed me to enjoy the season while capturing my memories at the same time – no more feeling guilty months or years later that I hadn’t scrapped that season! After years of success with the Holiday Faves, I’ve expanded The Faves Project to include the Summer Faves and this year for the first time, I’m putting a fall-tastic spin on it with the Fall Faves. TIME is always going to be your greatest enemy. There will always another home task/project/family matter to draw your attention away. And sadly, there’s no magic time fairy on her way to bestow the gift of “finding time” and “making time” onto you. 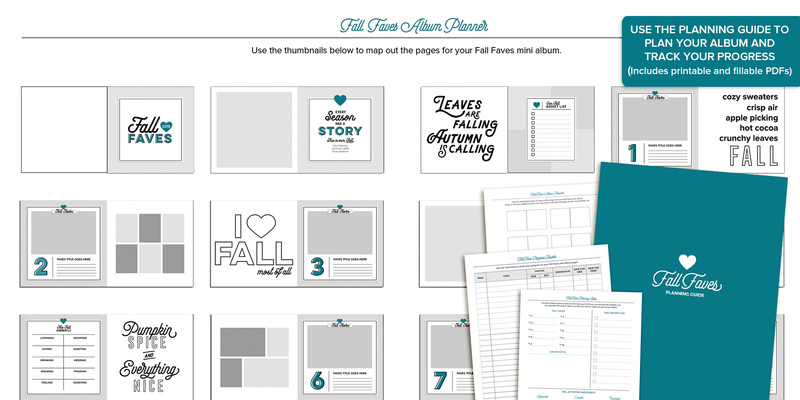 Fall Faves is my solution for creating an easy, mess-free, stress-free seasonal digital scrapbooking or hybrid mini album. No worrying about capturing daily details, the focus here is simply on capturing your top ten favorite things from Fall, using all the digital scrapbooking supplies you already know and love. and the fact that it’s DOABLE. 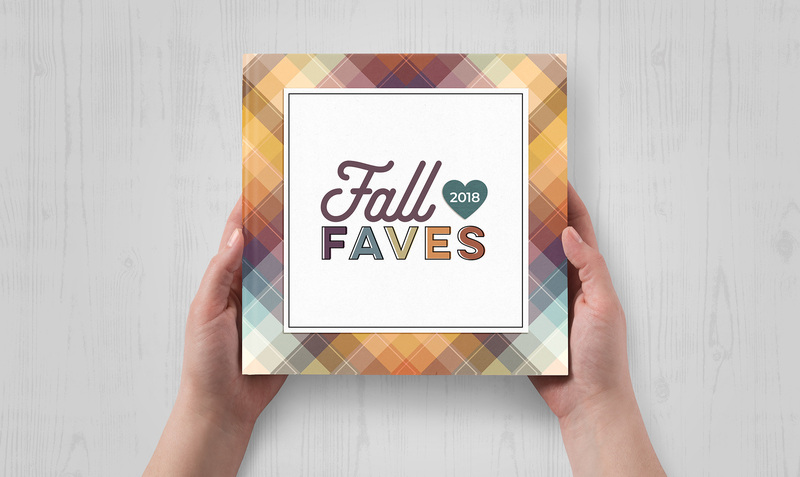 As soon as you sign up for the Fall Faves, you’ll receive an email with a download link to this year’s Fall Faves 8×8-inch Mini Album templates. Each template file is labeled in order so the foundation of your album is already planned – no more stressing about which page should go where. On Tuesday, October 2nd our 6-week Fall Faves Project Class will begin. During the first week of class, you’ll receive access to the Fall Faves Interactive Planning Guide which includes tools for mapping out your pages and tracking your progress. You’ll also receive a link to our private Facebook group where you can hang out with all of the other Fall Favers, ask questions and share your work – this is where the real magic happens! Now the fun part begins, it’s time to scrap! Every Thursday during Fall Faves, I will send you an email with a set of pages for you to work on that week. I will also share the progress I’ve made on my own Fall Faves album because yes, I’ll be scrapping right alongside you! As a group we will work on a small number of pages each week so that your album will be ready to send off to print by the end of class on Thursday, November 8th. The final step, send off your completed Fall Faves album for print as your very own photo book! I promise you, holding a completed seasonal album like the Fall Faves in your hot little hands will quickly become your new fave. Lynnette, you are a GENIUS. These album planning worksheets are going to completely change the way I digi-scrap! I have a neurotic need to know where I am on the road to finishing an album and these worksheets are totally doing it for me. Seeing those thumbnails go from greyscale to color is almost more satisfying than putting a checkmark on a to-do list. I love the planning guides for figuring out how the book will come together before I get to the loading it up on the website part. I’m a visual person and love using the worksheets and seeing the overall plan mapped out. Who is the Fall Faves for? Fall Faves is for any tech-lovin’ memory keeper who’s interested in creating their very own list-lovin’ fall mini album. If you love the idea of creating a mini album but want something a bit more easy and doable than what you’ve tried in the past, I have confidence the Fall Faves Project is the right solution for you. Do I need to be a digital scrapbooker to participate in the Fall Faves Project? 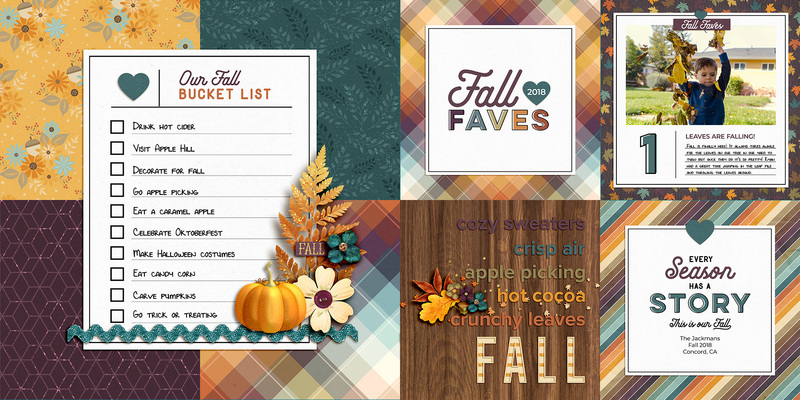 Because the Fall Faves includes digital scrapbooking templates, you’ll get the most out of it if you are open to hybrid or digital scrapbooking. But new scrapbookers are always welcome! Absolutely! 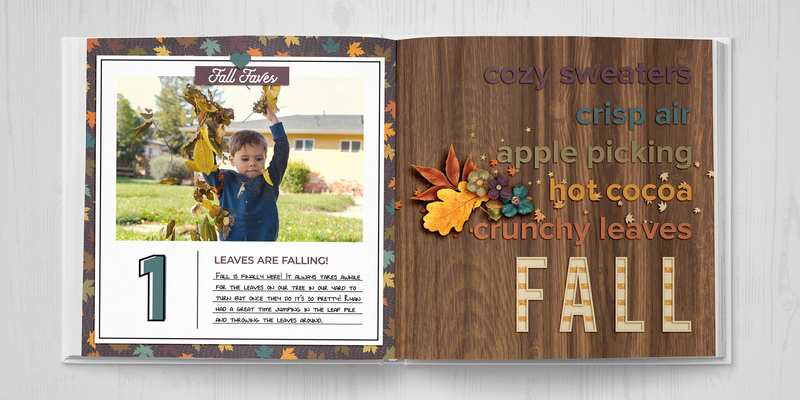 The Fall Faves is a great first project if you’re interested in giving digital or hybrid scrapbooking a try. I’ll be more than happy to answer any questions you might have along the way. What software do I need to use the mini album templates? You’ll need a program that can handle and manipulate a layered Photoshop (.PSD) file. 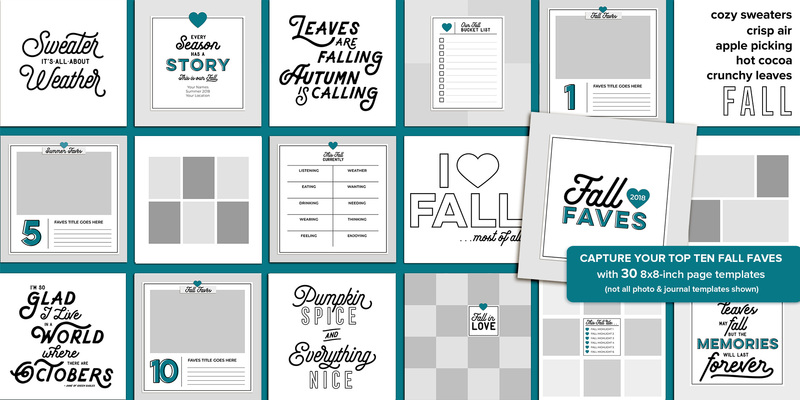 In order to keep things simple, the Fall Faves templates are only available in Photoshop (.PSD) format. Do the Fall Faves templates include any drop shadowing? Some of the templates include basic drop shadowing and layer styling which can be easily customized or removed. What size are the Fall Faves templates? The Summer Faves templates are 8×8 inches. You can either print your mini album as 8×8 or it can be scaled down to 6×6 inches if you’d like something smaller. How do I print my completed album? Once you’ve completed your pages in Photoshop, you will save your layouts as flattened JPG images which can then be printed as a photo book through your favorite photo book company or printed as single layouts which can be added into any traditional scrapbooking album. What does the schedule for the 2018 Fall Faves look like? The 2018 Fall Faves will run from Tuesday, October 2nd to Thursday, November 8th. The classroom opens on Tuesday, October 2nd and then every Thursday you will receive an email from me. What if I’m on busy during part of the class? Can I still participate? Absolutely! Although we will be following a schedule in the class, you can absolutely work at your own pace as well. There will also be one break week included in the course which you can use to catch up on any pages you’ve missed. This is also why we’re only working on a small number of pages each week – even if you miss a week or two, it’s still easy to catch up. When does registration for the 2018 Fall Faves Project end? Registration ends Monday, October 1st at 11:59pm PDT. Class begins Tuesday, October 2nd. Does the class meet at a certain time? Does it matter what part of the world I’m in? Fall Faves is 100% virtual so you can participate from anywhere at anytime. After you’ve signed up for the Fall Faves, you’ll receive three emails: one with a receipt, one with a link to download your templates and a third email from me with details on what to expect in the class. Because you don’t remember nearly as much stuff as you think you do. Because holding a physical book of your favorite Fall adventures in your hot little hands is sure to be your new fave. I love having that album summarizing the season sitting on the shelf. The graphic-style helps keep the scrapping simple and still gives you creative freedom to dress things up in whatever way makes you happy. Yeah, I’m a Nettio project addict. They are totally do-able and I look forward to working on them. The Faves is a great way to document those seasonal memories and ensure that the season doesn’t slip away, without taking a lot of time or energy. The templates are easy to complete, with a simple cohesive design that looks great with or without embellishments.